The facility in Bavaria incorporates what is said to be a spectacular intralogistics system and will be completed by spring of 2021. It is one of the largest orders in TGW's company history and the official go-ahead for the large-scale project was given at the ground-breaking ceremony on 18 February 2019. With Puma-CFO Michael Lämmermann in attendance, the project was officially launched with a special ceremony. “Almost the entire TGW portfolio will be featured in this unique project. Puma is now ideally positioned for the future,” says Christoph Wolkerstorfer, CSO of the TGW Logistics Group. 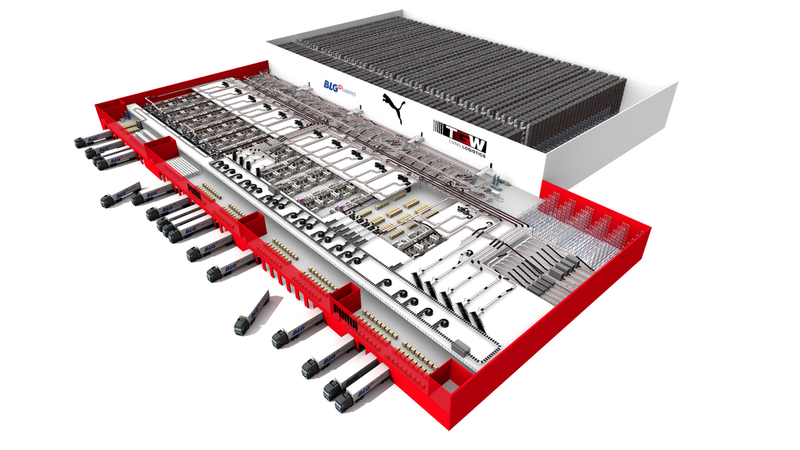 The FlashPick-system, which is TGW’s smart one-stop solution for automated single-piece picking is the core of the system, custom-designed by TGW for Puma. The flexible system guarantees high performance and short processing times for B2C as well as B2B. The 24-aisle shuttle warehouse offers an impressive 730,000 storage slots. 500 Stingray shuttles will handle storage and retrieval. When an order is placed, the cartons are retrieved fully automatically and then picked or packed according to customer requirements. The individual functional areas are interconnected by more than 21 kilometres of energy-efficient KingDrive-conveyor technology. Puma will continue to rely on the competence and experience of TGW long after the go-live. As part of a 10-year Lifetime Services contract, more than 30 local specialists will continue to ensure that the system runs smoothly, 24/7.